Her dog died suddenly, with no apparent warning that anything was wrong. I know what a hole in the heart those little furry critters leave when they pass. And it keeps hurting for a long time, too....every time you come home and they aren't waiting by the door, tail-waggingly ecstatic to see you. For some reason, I never can get my husband to greet me that way. Oh, I need one of these for a friend too. Great card! TFS this pretty and heartfelt card (hug in an envelope). Very nice card. I know it will mean a lot to your friend! I hope this helps heal her heart a little. Very cute little bone accessory. I am sure that your friend is comforted by your warm thoughts and this beautiful card! So sorry for your friend. That is such a lovely card you made. The paw prints on the heart are perfect. 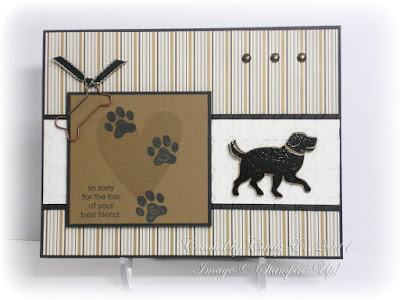 Such a pretty card for your friend.